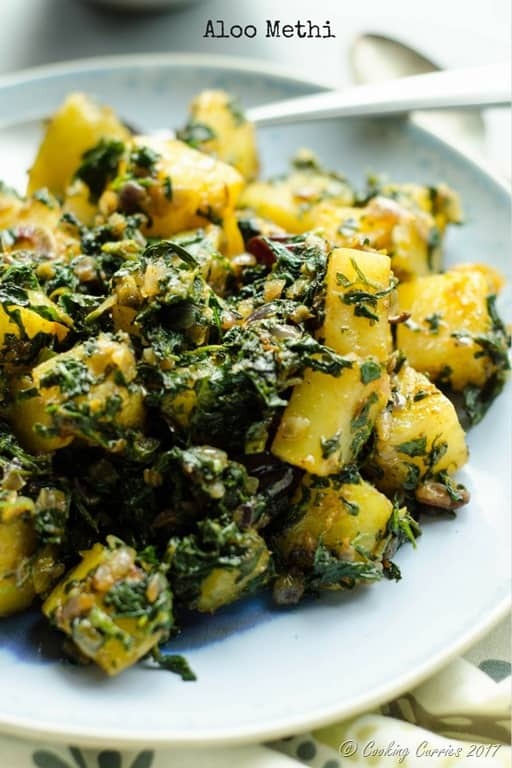 Fragrant methi / fenugreek leaves come together with potatoes to make this simple and delicious Aloo Methi, that is an easy side for rotis or rice. Simple food that just bursts into flavors when combined with the right pairing, that is the whole essence of eating well, in my books. Not a lot of oil or masalas, just highlighting the main two ingredients. 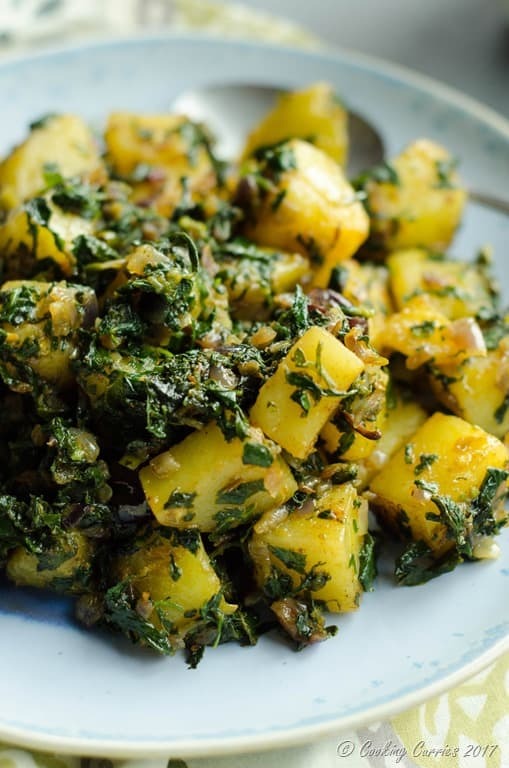 This Aloo Methi recipe that brings together the earthiness of the potatoes along with the fragrance and slight bitterness of the methi leaves is a wonderful example of that. Once you taste some of this, you will know what I am talking about. And trust me, you will not be able to stop at just one serving of this. Methi leaves are bitter and can get a lot more bitter when cooked. 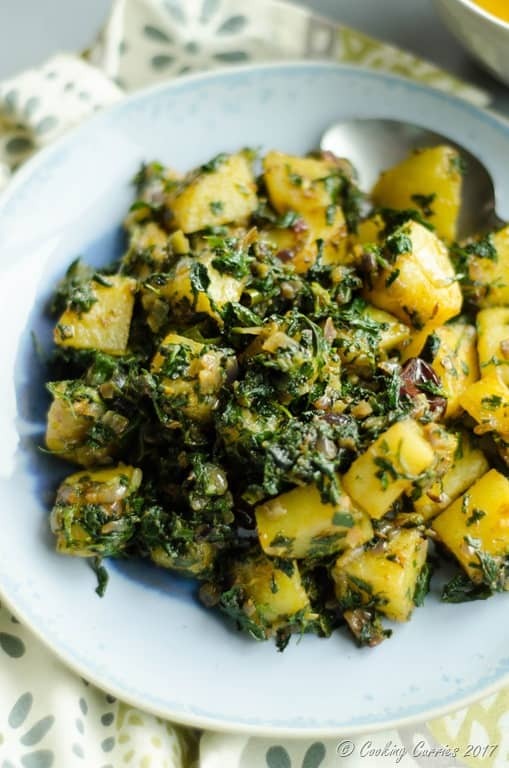 The trick in this recipe to take care of that bitterness to make is edible with just a hint of that wonderful earthy bitterness in it is to sprinkle salt over chopped methi leaves and let it rest for several minutes. Then the methi leaves are squeezed to get all the salty water out of it which takes out some of its bitterness too. 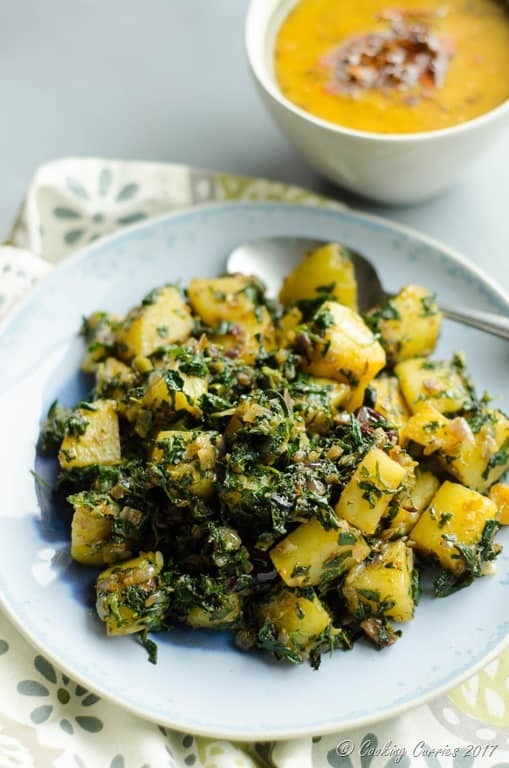 It is then added to the cooked potatoes along with the turmeric, cumin and chillies to blend well together to a fantastic side dish of Aloo Methi. Wash the methi leaves thoroughly and cut the stems near the roots and discard. Chop the rest, place in a bowl and add about 2 tsp salt to it. Mix well and keep aside. Heat the oil in a heavy bottomed pan. Add the cumin seeds, asafetida and dried red chillies. Once the cumin and chillie start to turn color, add the onion and green chillies. Saute till the onions start to become soft. Add the potatoes, give it a quick stir to mix everything together, cover and cook over low heat for 7-8 minutes, till the potatoes are almost tender. Now squeeze the methi leaves to take out any water from them. Add to the pan with the potatoes. Add turmeric powder, coriander powder, Kashmiri chili powder and salt. Give it a quick stir and let it cook over medium heat for 3-4 minutes. Remove from heat and serve hot with rotis and dal or rice and dal. Heat the oil in a heavy bottomed pan. Add the cumin seeds, asafetida and dried red chillies. Once the cumin and chillie start to turn color, add the onion and green chillies. Sauté till the onions start to become soft. I love fenugreek! Great addition to some potatoes. This looks amazing! I love all the herbs and spices on top. I’ve never cooked with methi leaves. I love all of the herbs and spices you used in this. Tried this recipe and it’s very tasty with pooris n phulkas !! Thank you, Bhuvana! That makes me so happy, especially to hear that kids loved something with greens in it. Your kids must be wonderful eaters. Kudos!